By Karrar Haider in Desktop. Updated on November 3, 2017 . Automatically switching wallpapers is probably the best way to keep your desktop fresh and full of surprises. I personally have a great collection of beautiful wallpapers and like them to keep switching on my screen. 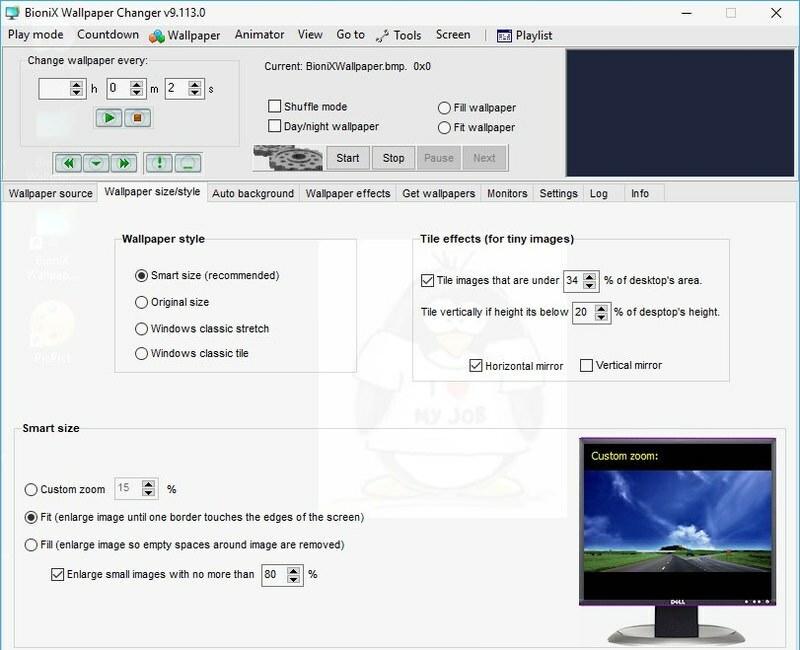 So, whether you are a desktop wallpaper fanatic or just want to charm up your computer’s screen, like me, I can show you 3 ways to automatically change wallpapers in Windows 10. Let’s have a look. 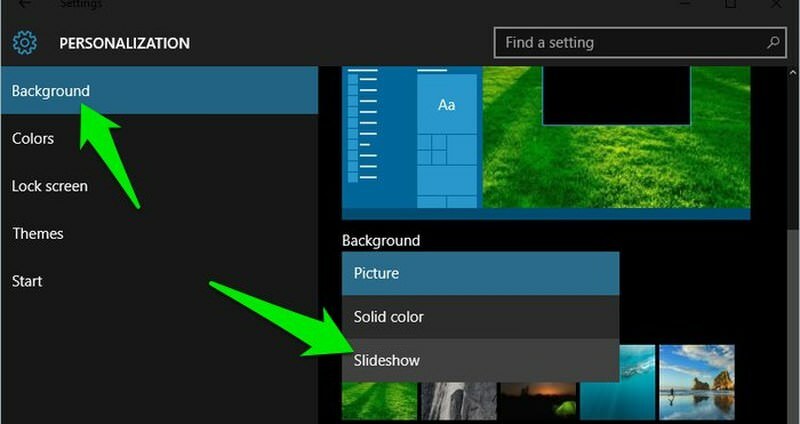 Windows has a built-in slideshow feature that can automatically change your wallpaper after a set interval. This feature only works with your own collection of wallpapers so the wallpapers must be downloaded first. Windows 10 only accepts a single folder containing wallpaper collection. So first, put all your favorite wallpapers in a single folder. Now move to Windows Settings > Personalize > Background. Here click on the drop-down menu below Background and select Slideshow. Afterward, click on the Browse button below and select the wallpaper collection folder you created. To set the interval, click on the drop-down menu below the Change picture every heading and select the required interval (ranging from 1 minute to 1 day). That’s it, now your desktop screen will automatically switch to a new wallpaper after the set interval. JBS is my first choice for its no-nonsense interface and working. To get you started, it has some default sets that don’t require any setup. You just select the set, and mesmerizing wallpapers start appearing. 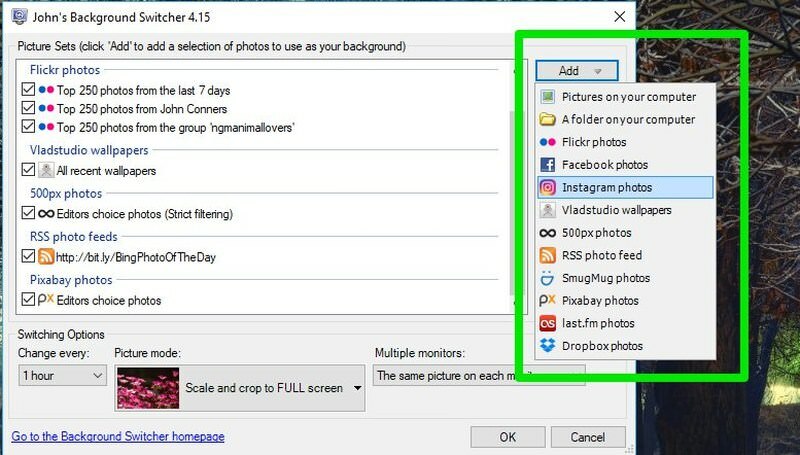 If you want to create your own sources for downloading wallpapers, then you can get wallpapers from Instagram, Flickr, Facebook, SmugMug Photos, Vladstudio, Pixabay, and a few others. You can also include your own wallpaper collection, along with these resources. There is also an option to add any media RSS, basically allowing you to get wallpapers from any image websites, such as DeviantArt or Behance. Interestingly, each resource has further options to get the required wallpapers, that I must say are very customizable. For example, from Flickr, you can get images based on time period, tag, keyword, person, group, and even your own Flickr photos. I also really like its picture mode option that gives you full control over how you want the wallpaper to be applied. 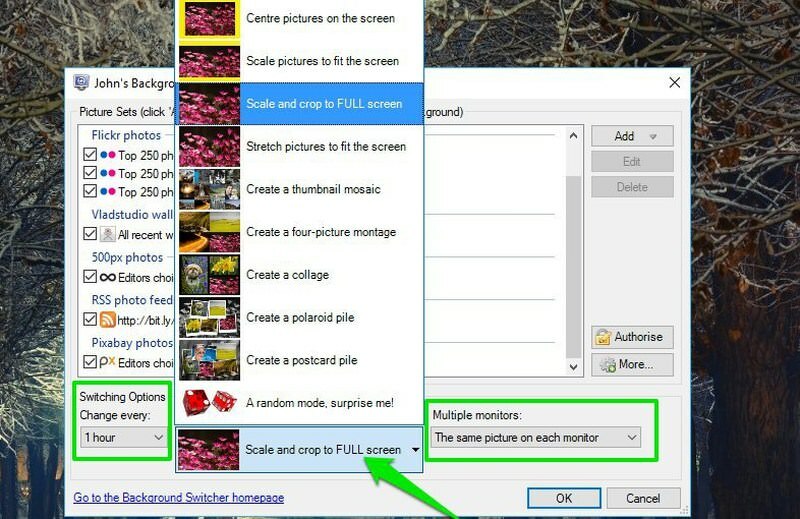 You can crop and fit, stretch, scale, and even get collages and montages using multiple images. For changing wallpapers, you can select the interval from 10 seconds to 7 days. And best of all, it has support for dual monitors with dedicated options to charm your dual monitor setup. Supports reliable sources along with RSS support. Default preset to get you started. Simple, but limited in features. When it comes to features and customizability, BioniX is decades ahead of JBS. However, in my experience, it’s a bit difficult to use and will work probably best in the hands of an advanced user. The interface is a bit clunky and overwhelming, to the point I might just say “it’s not user-friendly”. I actually had to spend a few hours just to understand the tool and start adding wallpaper sources. If you can deal with the interface, then it’s the most robust tool for manage desktop wallpapers. 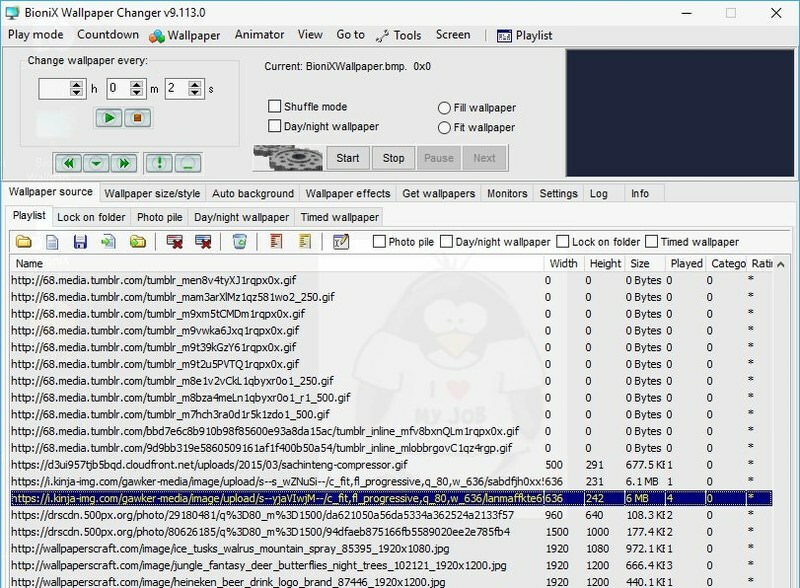 For wallpaper sources, you can either use Flickr Mass Downloader to download wallpapers from Flickr, or manually enter URLs of web pages from where you want to download images. This approach does offer more control over what exactly you want, but it’s also a cumbersome task. To list a few of its unique features, you can add effects to all wallpapers, get day/night wallpapers based on time, get dynamic webcam wallpapers, dedicated shortcuts, automatic categorization, filter to reject bad wallpapers (low resolution), and much more. Can add images from any website on the web. Day/night to show light or dark wallpapers at the respective time. Get images from public webcams. The interface is a bit difficult to use. Adding wallpapers sources requires more manual intervention. For both the above tools, dedicated pause and play buttons are available to start and pause wallpaper switching. Once you add the required resources, use these buttons to control the wallpapers. Bing is known for its Daily Background Image that replaces its homepage with a new wallpaper every day. Many people only visit Bing to see its daily wallpaper, and I am sure you’ll agree that they are amazing. 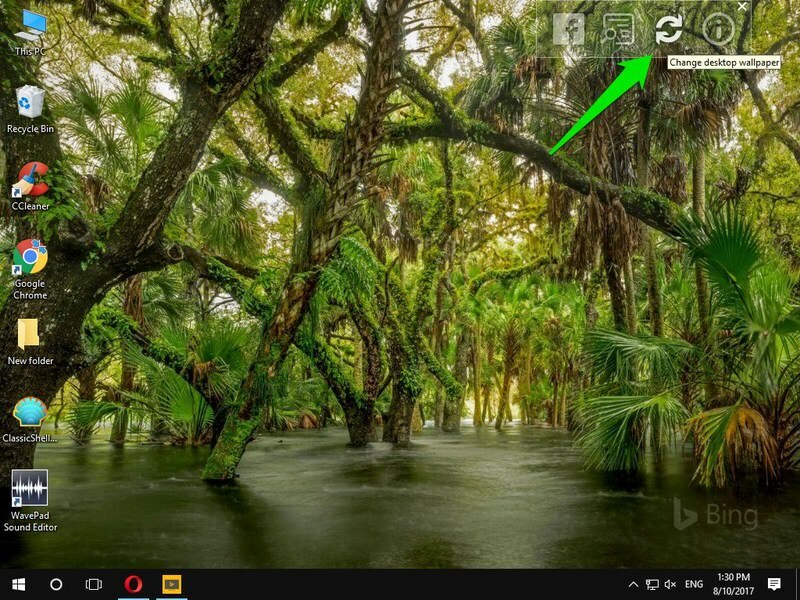 If you find Bing background images beautiful, then you can get them on your PC as well. Using the Bing desktop app, you can change your wallpaper with latest Bing Daily Background Image as soon as it is updated. Download the Bing desktop app and install it. 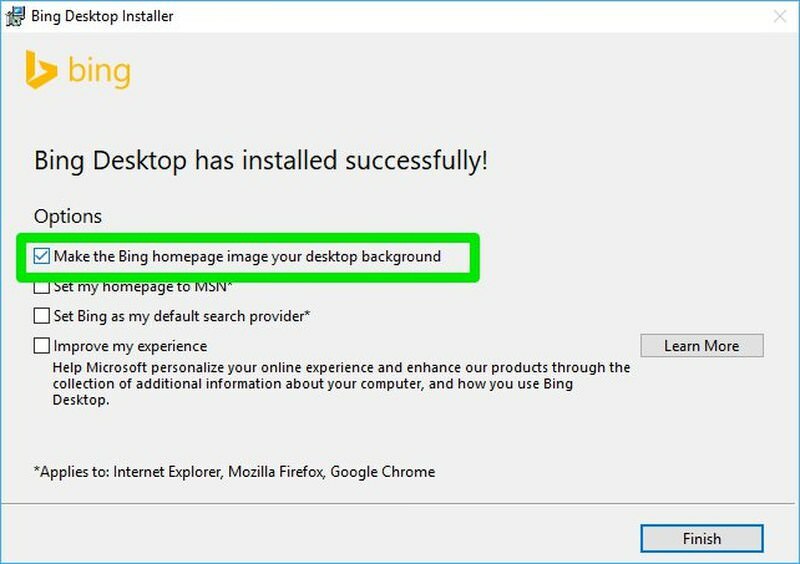 At the end of the installation, check the check box next to Make the Bing homepage image your desktop background. You may check or uncheck other provided options as you please. That’s it, after a few seconds your desktop wallpaper will be changed with Bing’s Daily Background Image. You will also notice a transparent bar at the top-right corner of the desktop. From here you can get more information about the image or click the Change desktop wallpaper button to switch wallpaper to a random one from Bing image archive. These three methods should be enough to keep your desktop fresh. I should mention that frequently changing wallpapers will affect the battery timing of your laptop. If you have a low battery, then it’s better to disable automatic wallpaper changing or slow it down at least. Furthermore, if you are using a ‘download and apply’ wallpapers service, then your network data will be used and it may even slow down other network activities while downloading images. Don’t forget to let me know which method did you find the best, in the comments section below.